Another successful and amazing Golf Classic day. 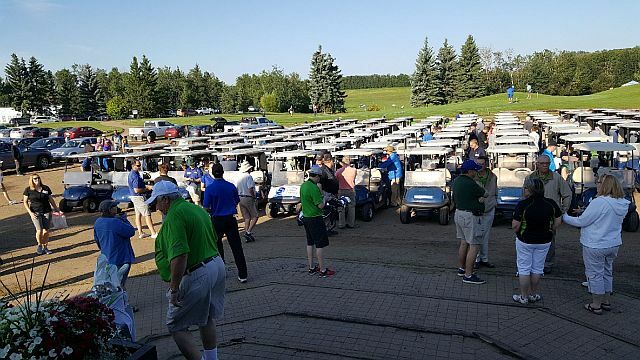 The 2018 event held on Thursday, August 9th boasted our typical (lucky) sunny weather and a full slate of eager golfers. 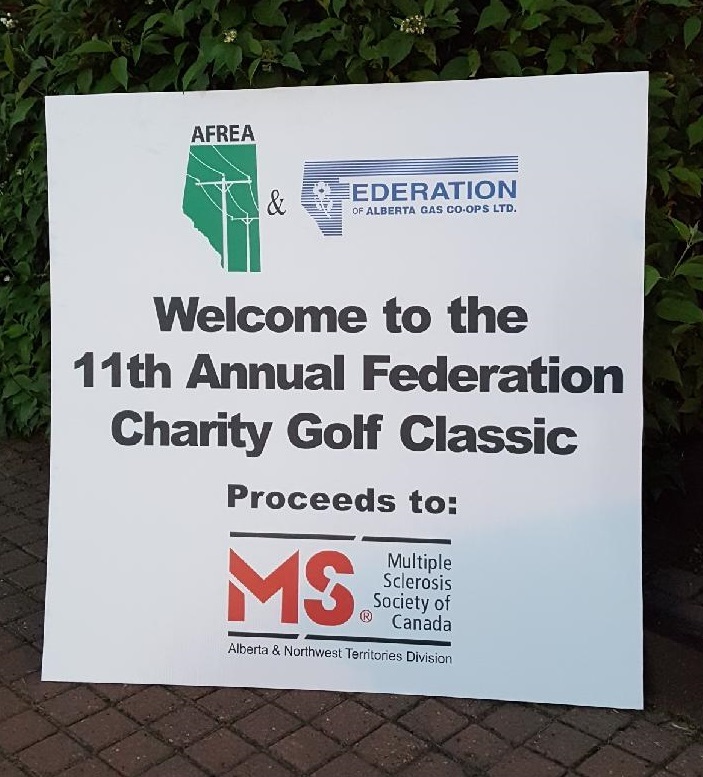 As has been for the past 11 years, proceeds from the tournament go to our charity of choice, the Multiple Sclerosis (MS) Society of Canada, Alberta & Northwest Territories Division. Donations are allocated to programs and education, information, advocacy, and awareness events in rural Alberta for both community members living with the disease and their healthcare professionals. 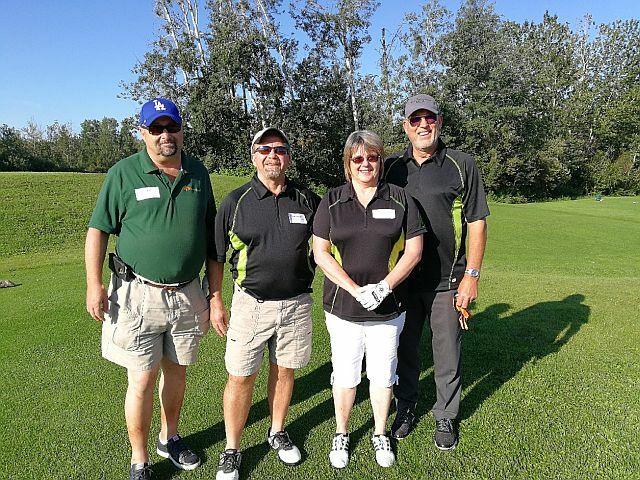 The Federation Charity Golf Classic, co-hosted with our co-op partner Federation of Gas Co-ops, is a highly anticipated and widely supported annual golf event. Thanks to our participants and sponsors we added to our accumulative total over the past 12 years - bringing it over the $300,000 mark. Thank you to everyone for their hard work and support. Our Federation Charity Golf Classic donation total climbs to over $280,000! Co-ops working together are proof that collaboration brings bigger rewards. Another beautiful Alberta day for the 11th year - we raised over $20,000 bringing our total to date to over $280,000! Thank you to everyone who had a hand in planning and presenting this amazing day of fun and fundraising. Thank you to everyone who donated, sponsored, and supported this great cause. Our 11th Annual Federation Charity Golf Classic 2017 was held on Thursday, August 10th at Goose Hummock Golf Resort. The Federation staff is busy readying the props and prizes in order to bring you another fanastic event. We are hoping Mothe r Nature cooperates to bring us a bright and sunny day for golf nd fun. Thank you so much to everyone who has a hand in making this a successful and amazing day! Last year we raised enough to push our total contributions over the past 10 years to over a quarter of a million dollars. Money donated to the MS Cause is money raised through registrations, sponsorships, golf-day auction, and donations. 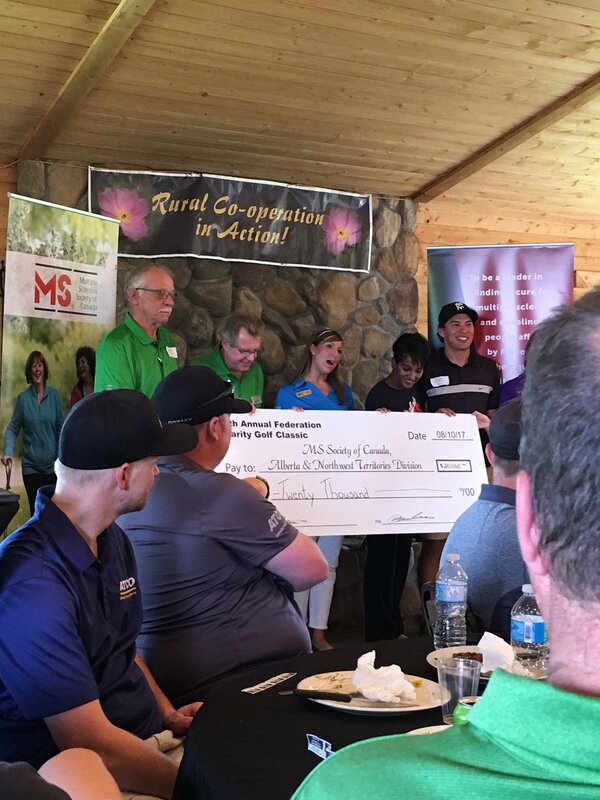 Proceeds from our Charity Classic event goes to the MS Society of Canada, Alberta & Northwest Territories Division toward funding programs and services for rural Albertans living with multiple sclerosis. September 2016 -the Federation girls, Dawn Dietz (FedGas) and Janeth Mitchell (AFREA), delivered the cashable version in person to the MS Society of Canada - AB & NWT Division. Dr. Garry Wheeler (President) and Johanna Green (Northern Regional Director) were on hand to receive our donation for $22,000.00. We are honored to continue to support this cause in hopes they find a cure! In the meantime, they provide essential programs and services to those who are suffering with the disease - those who live in rural areas where access to big city facilities is limited. Great job, everyone! August 2016 - Cheque presentation during the Charity Golf Classic 19th hole wind up BBQ. The sun shone bright on our 10th Annual Federation Charity Golf Classic held on Thursday, August 11th at Goose Hummock Golf Resort. We raised another $22,600 to add to our total contributions over the past 10 years. 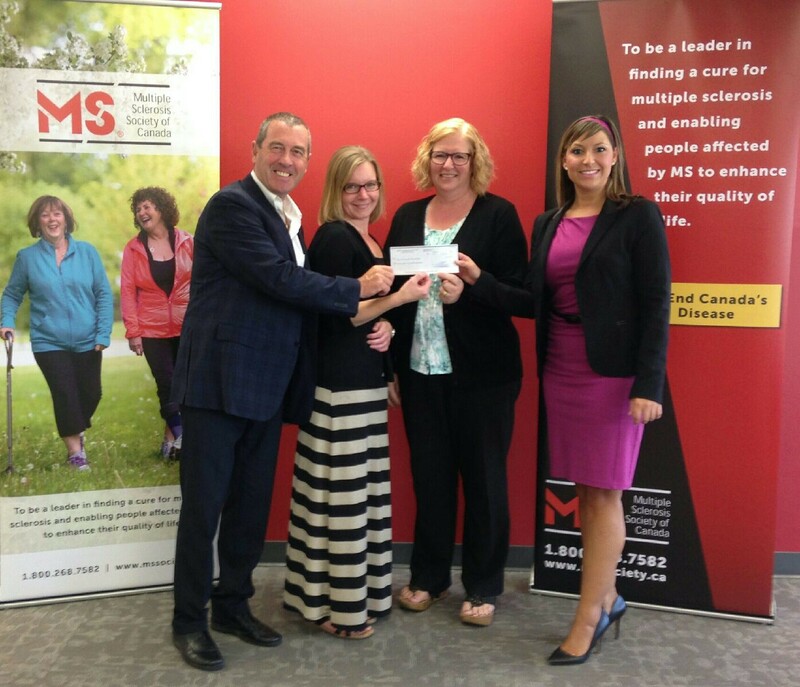 Money donated to the MS Cause is money raised through registrations, sponsorships, golf-day auction, and donations. Your generosity helped us raise over $22,000 in our 10th year of the event. Proceeds go to the MS Society of Canada, Alberta & Northwest Territories Division. Over the last 10 years, this event has raised over $257,000! Our contributions to the MS Society go towards helping rural patients with MS. See the 2016 Rural Impact Report listed below. The MS Society's work does not end until there is a cure for this disease. 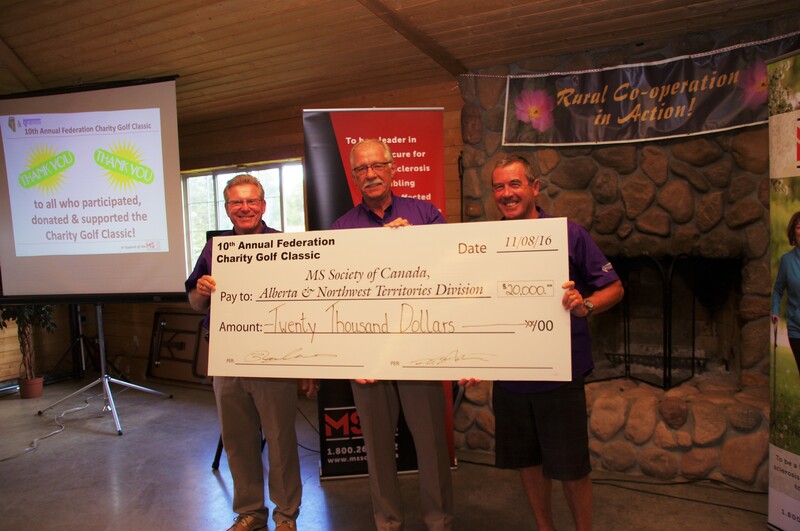 2016 RURAL IMPACT REPORT - download the PDF (below) from the MS Society showing where the monies donated go to help rural patients with MS in Alberta. Follow us on Facebook and Twitter to get all the "front line" details of events. 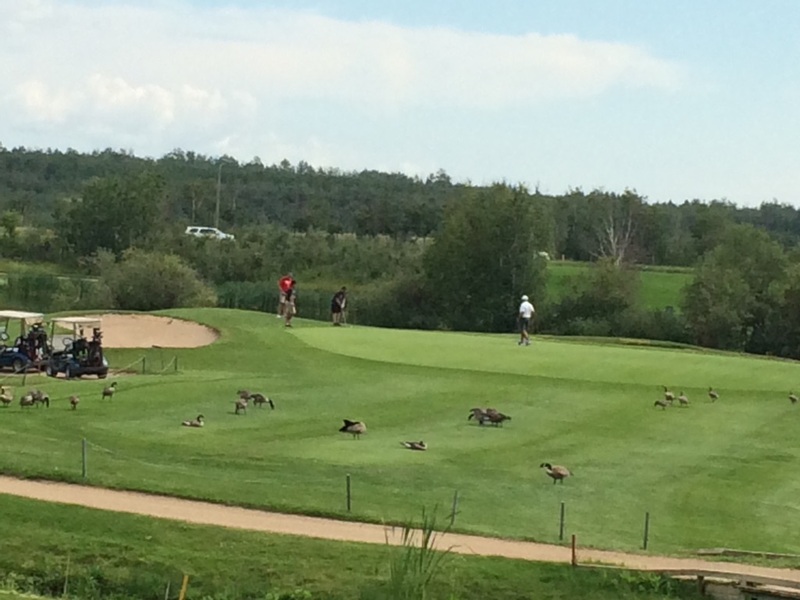 Thanks to our host course: Goose Hummock Golf Resort, North of Gibbons, Alberta on Highway 28 - click the logo to be directed to their web site.